One form of marketing communication that gets overlooked is podcasting. Podcasts offer several benefits, not the least of which is portability. You can listen to podcasts on the go via mobile devices and, unlike video, podcasts can run in the background while you participate in other activities. Using platforms like iTunes, you can subscribe to podcasts. When new episodes are recorded, they become instantly available for download. Podcasts cover nearly every imaginable topic, and many focus strictly on ecommerce. They are often easier to record and produce than video. In terms of equipment, some podcast platforms require little more than Internet access and a telephone. From a marketing standpoint, podcasts can be engaging and a good way to build an audience. They can also be less time-consuming to produce than a full-length blog post or article. Here are three options to get started using podcasts to market your ecommerce business. Blog Talk Radio is designed to host live shows. 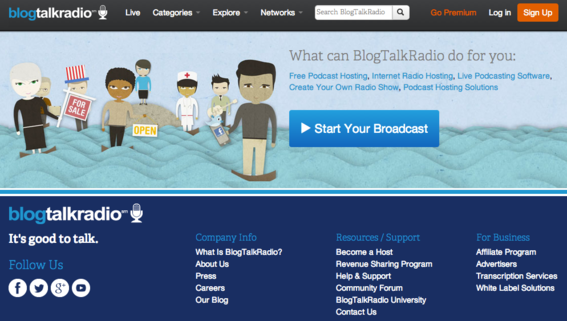 Launched in 2006, Blog Talk Radio is one of the oldest podcast networks. Program topics include art, business, family, food, health, and technology. Blog Talk Radio is also one of the easiest ways to start podcasting. The service includes everything you need, including hosting and podcast software. You can host a show live or record episodes using desktop software such as Audacity or Garage Band and then upload them to the network. Blog Talk Radio requires three steps. All shows are archived for on-demand listening. Even though the program is recorded live, my experience using BTR has shown that most listeners access shows on-demand for listening later. Premium plans, which start at $39 per month, offer additional features such as the ability to moderate live callers, schedule programs during prime time slots, host the show using Skype, create longer shows, and have more live callers. Set up your show. Setting up a show only takes a few minutes. You create an account by supplying a username, password, and email address, add a show title and description, and select a category. Host your show. Once the set up process is complete, the platform asks you to schedule your first show, which includes the following information. Start audio — BTR provides an extensive selection from which to choose. The podcast software — which BTR refers to as a “studio” — includes a switchboard for callers, audio upload dashboard, live chat features and promotional options. SoundCloud is another popular podcast network. 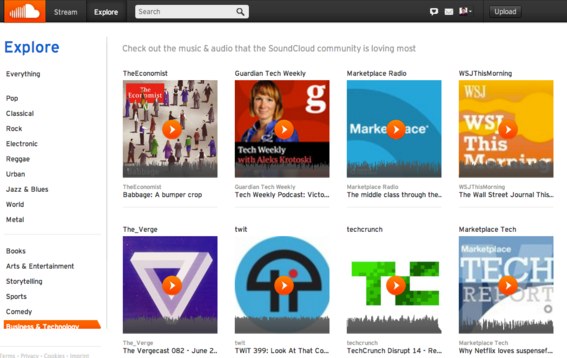 SoundCloud is another popular podcast network. However, unlike Blog Talk Radio, it is designed for on-demand consumption. Once an account is set up, SoundCloud provides you with your own channel. Upload a previously recorded file. Users can record directly to SoundCloud or upload recordings. Recordings can be kept private so they are available only to a select group of listeners, or made public, accessible by anyone. You can share podcasts via social networks like Facebook and Twitter. Podcasts can also be submitted to iTunes. 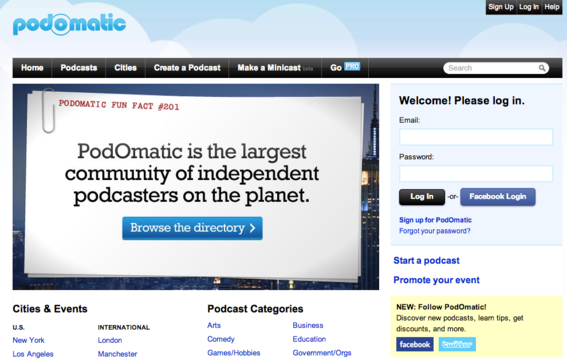 Podomatic is another easy way to start podcasting. Podomatic is another podcast hosting site, also free, that allows you to upload audio recordings or record on the site via a webcam or microphone. Users get their own page where the podcasts are displayed. You can use a smartphone app or desktop microphone to record podcasts. However, a few pieces of equipment are needed to improve the recording’s quality. High quality microphone. Veteran podcaster and small business marketing consultant John Jantsch recommends the Blue Yetti USB mic. It comes with many professional features, but costs only $100. Another popular, more affordable mic, is the Blue Snowball. At $69, it still produces a high quality sound. Both mics are designed for desktop use. An inexpensive mic for portable use is iRig. It costs $60 and works on both iOS and Android devices. Editing software. My favorite editing software is Audacity. It’s free and works on either PC or Mac. The controls are fairly intuitive, so the learning curve is short. Mac users may prefer Garage Band, however, which offers more features. Though typically used for recording and mixing music, it works just as well for the spoken word. Headset. You will also need a headset to better hear yourself. Many options are available and some come with built-in microphones. Podcasting does not require a lot of time, technical know-how, or equipment. But it provides merchants with a way to engage an audience and build community around their brand, products, and services.